A picture of our baby chicks. They are no longer babies however I think they will be very pretty hens. We got them at Rural King. It is new to this area. We really like going there. We got these for .99 cents each because they were already a week old. They needed to move these out to make room for a new delivery. And yes that is my shadow! 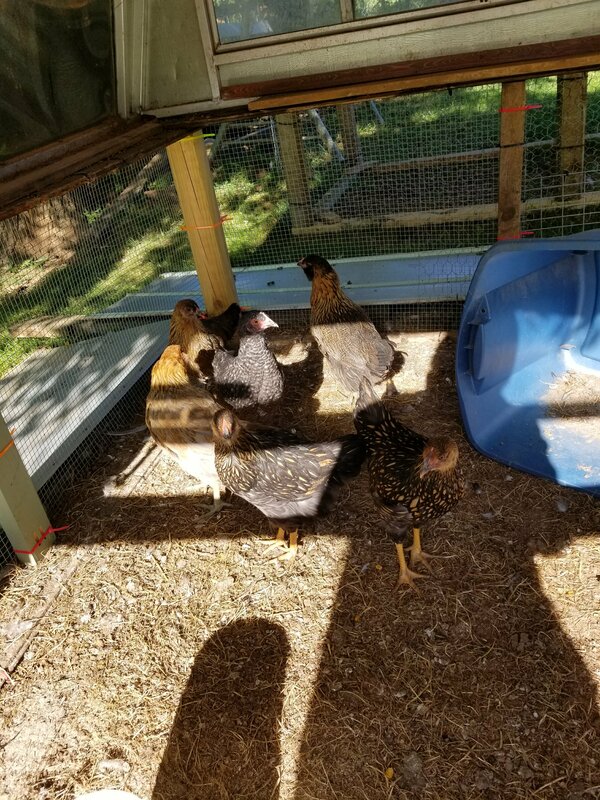 The girls and I made this coop. We are pretty satisfied with how it turned out. It solved two issues. 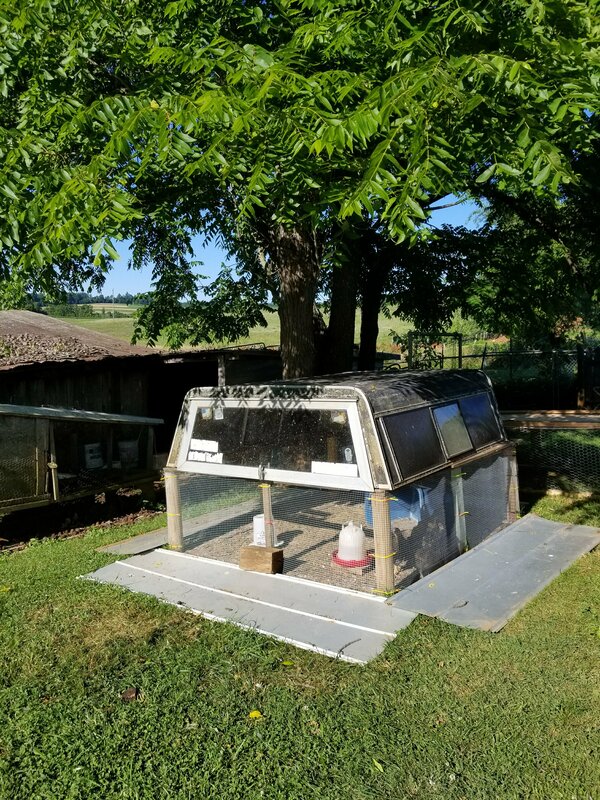 The baby chicks needed a place to be and the camper top is getting used. Then one of Grace’s ducks hatched off baby ducks. We were all so happy. 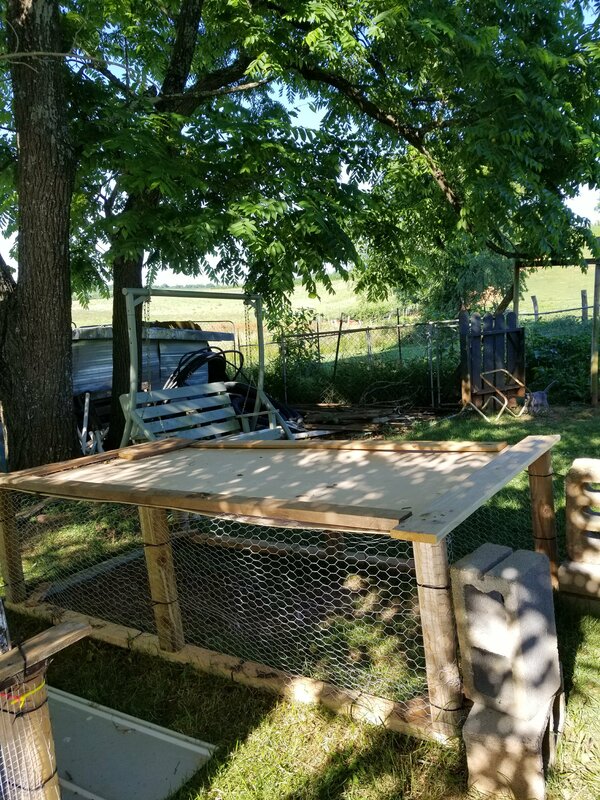 We built another coop along the same design as the other one. We made one big mistake though. We used chicken wire. I had no idea an animal could chew through chicken wire but something did. It got her baby ducks. So sad. I am pretty positive it was a weasel. 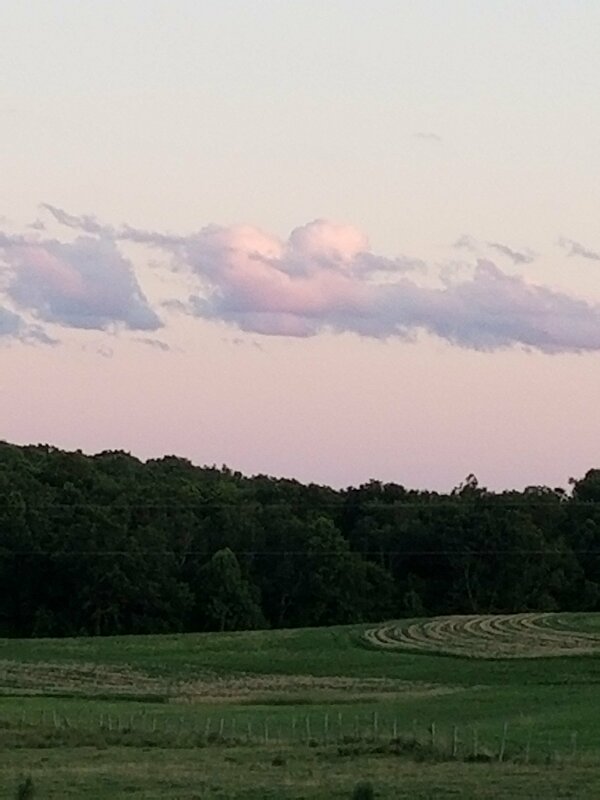 I will leave you all with this pretty cloud picture I took the other evening. God is so good! Hello everyone. 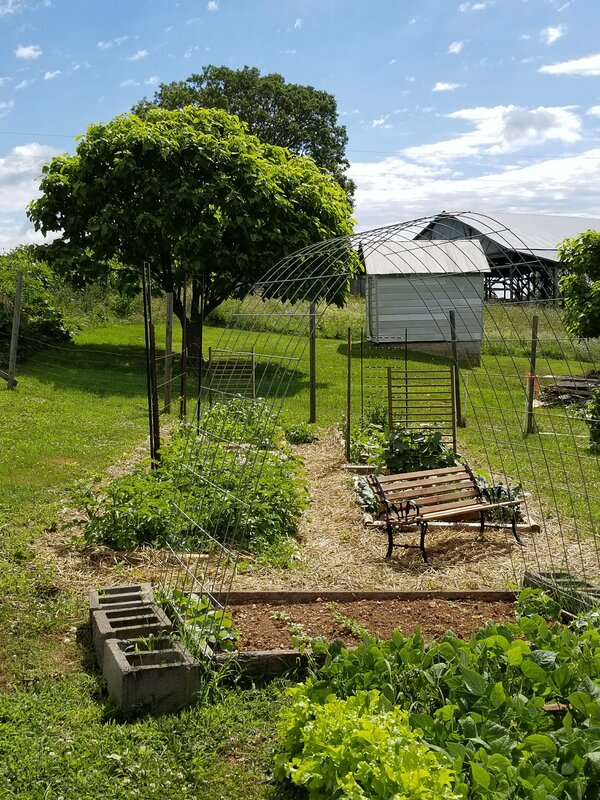 I thought I would share a few garden pictures today. I took most of these pictures sitting in this bench George made for us several years ago. It is one of my favorite sitting places. Of course, I have MANY favorite sitting places. I want to get an apple tree to put next to it. That way we would have shade and fruit. I like that idea. 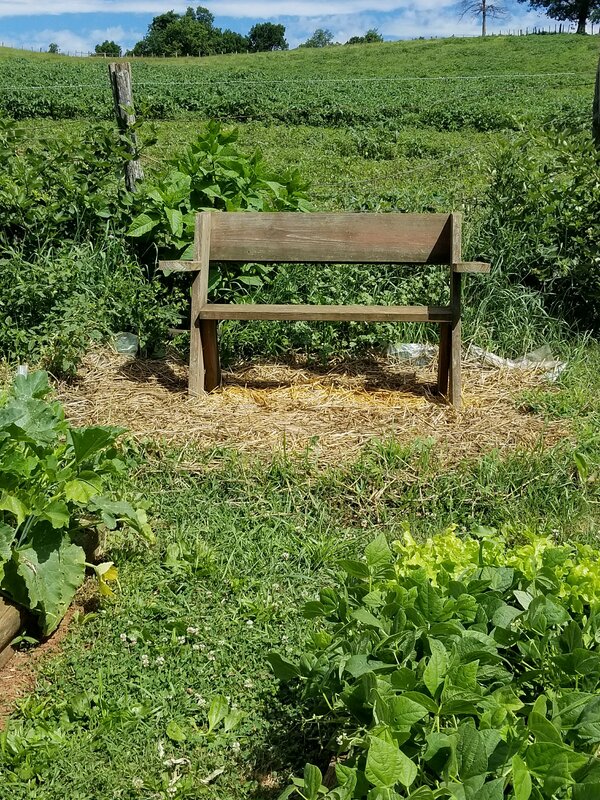 The girls and I have been working hard at trying to make the garden look cute and be productive at the same time. 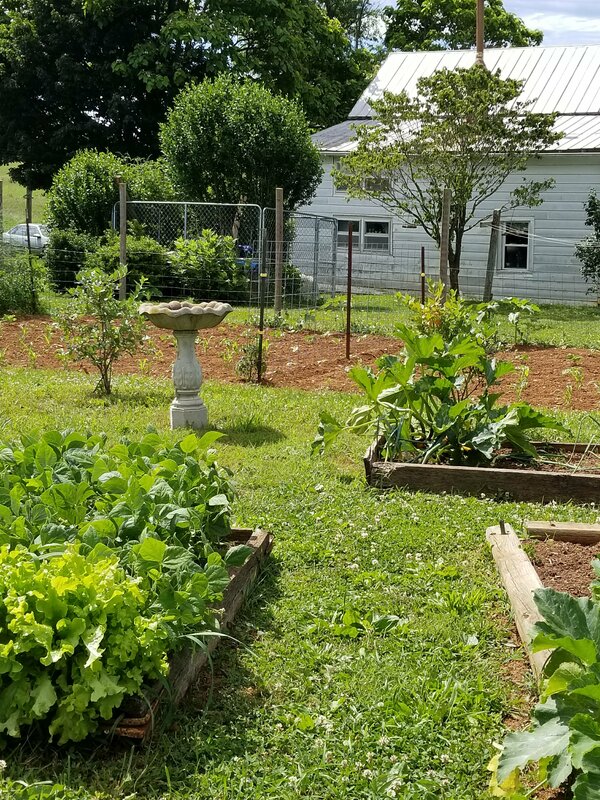 We built 5 raised beds and added them to the upper garden. We added an arch for cantelope and watermelon to run on. We are hoping that by keeping them off the ground maybe the bugs won’t eat them up. 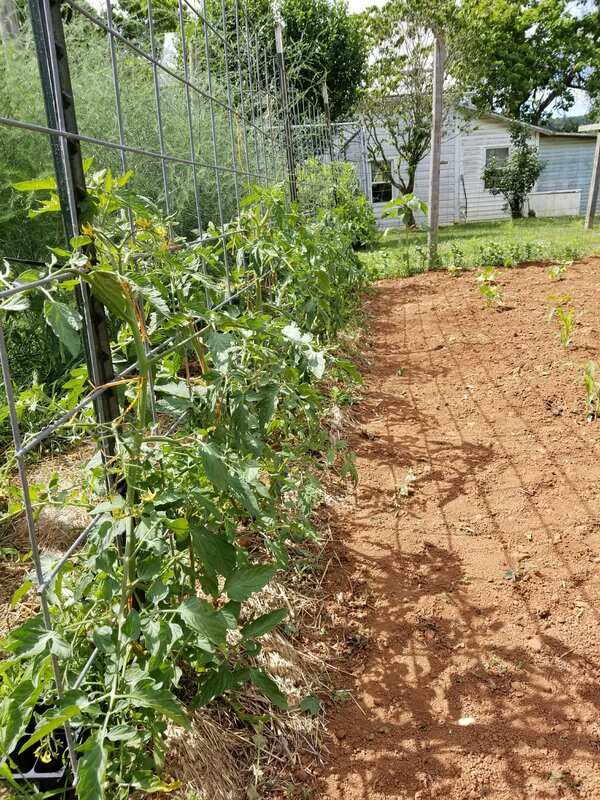 We also put several trellises in the beds for things like beans and cucumbers to run up. We are trying to take advantage of all our space. Just another garden picture. The lower garden has no beds in it yet. 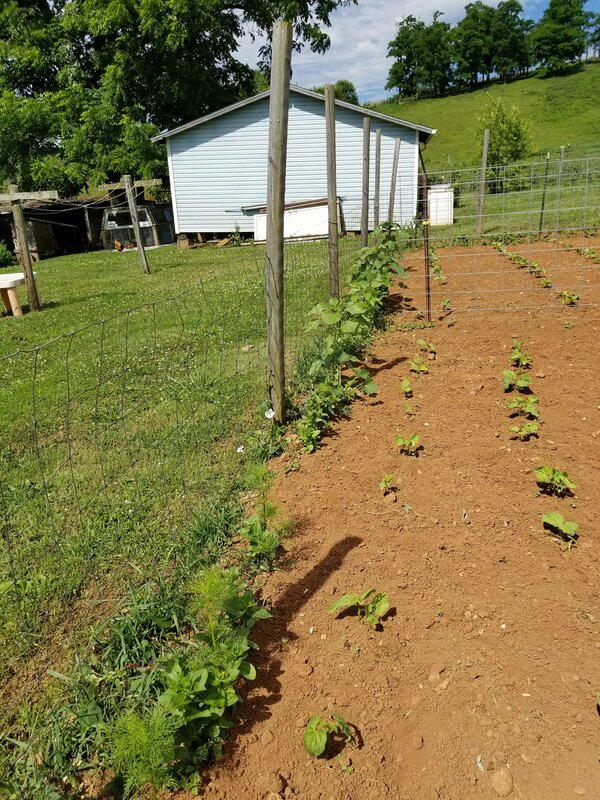 We planted beans and corn in it. 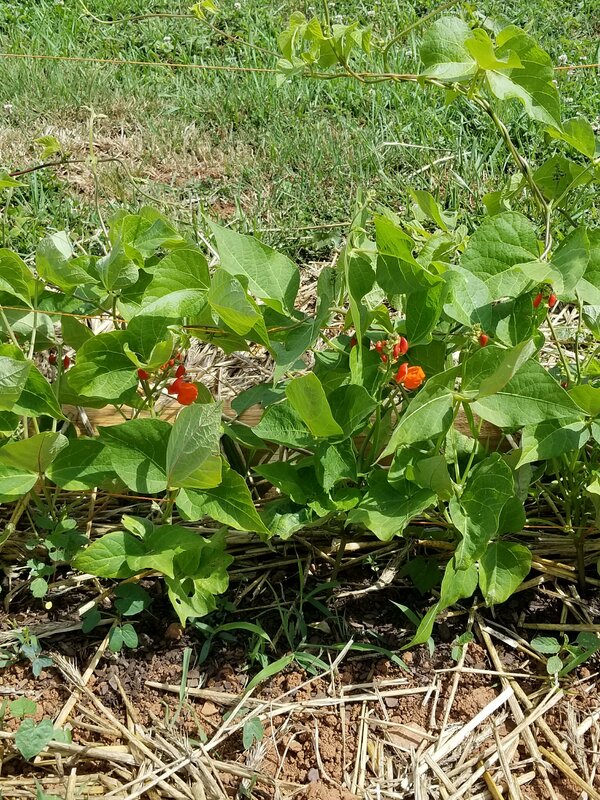 These are scarlet runner beans. I have never planted them before but the blooms are very pretty. Our tomatoes. We love using these cattle panels. Our row of flowers at the edge of the garden. They seem to be growing nicely. I can’t wait until they start blooming. Hopefully they will be pretty. I took these pictures this morning when I went up to pick these. 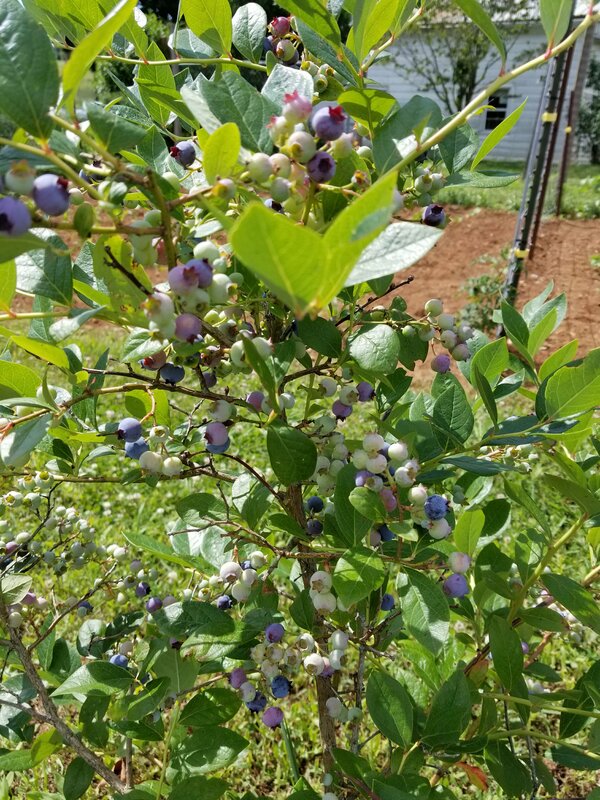 We will be having blueberry cobbler with supper. That’s it for now. I hope you have nice day and God bless. Hello everyone! I’m back to blogging. I am very happy. Dave taught me how to make posts and put pictures on from my phone. 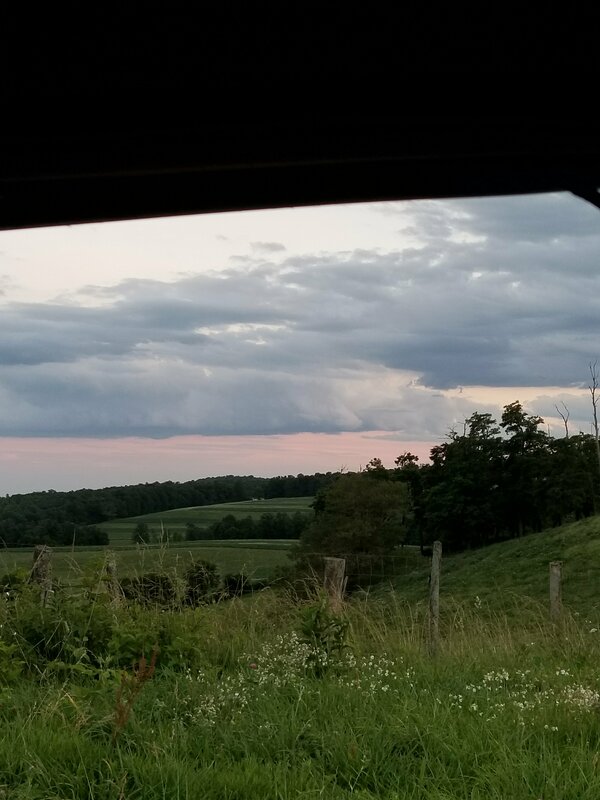 I took this picture at the top of the hill above our house. We have been enjoying cooler temperatures here and I love it. It makes for really nice sleeping. Well that’s all for my first post. I hope you all have a great night and God bless.